Elsie de Wolfe, also known as Lady Mendl, (December 20, c. 1859 – July 12, 1950) was an American actress, interior decorator, nominal author of the influential 1913 book The House in Good Taste, and a prominent figure in New York, Paris, and London society. According to The New Yorker, "Interior design as a profession was invented by Elsie de Wolfe," although the praise is not strictly true. She was certainly the most famous name in the field until the 1930s, but the profession of interior decorator/designer was recognized as a promising one as early as 1900, five years before she received her first official commission, the Colony Club in New York. During her married life (from 1926 until her death in 1950), the press often referred to her as Lady Mendl. She was born in New York City and died in Versailles, France. Cremated, her ashes were placed in a common grave, the lease expired, at Père Lachaise Cemetery in Paris. 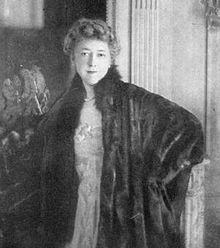 Among de Wolfe's distinguished clients were Amy Vanderbilt, Anne Morgan, the Duke and Duchess of Windsor, and Henry Clay and Adelaide Frick. She transformed the interiors of wealthy homes from dark wood, heavily curtained palaces into light, intimate spaces featuring fresh colors and a reliance on 18th-century French furniture and accessories. "She ran [in] ... and looked at the walls, which had been papered in a [William] Morris design of gray palm-leaves and splotches of bright red and green on a background of dull tan. Something terrible that cut like a knife came up inside her. She threw herself on the floor, kicking with stiffened legs, as she beat her hands on the carpet.... She cried out, over and over: ‘It's so ugly! It's so ugly.’"
Hutton Wilkinson, president of the Elsie de Wolfe Foundation, clarified that many things de Wolfe hated, such as "pickle and plum Morris furniture," are prized today by museums and designers. "De Wolfe simply didn't like Victorian, the high style of her sad childhood," Wilkinson wrote, "and chose to banish it from her design vocabulary." De Wolfe's first career choice was that of actress. She originally appeared with the Amateur Comedy Club in New York City as Lady Clara Seymour in A Cup of Tea (April 1886) and as Maude Ashley in Sunshine (December 1886), a one-act comedy by Fred W. Broughton. Her success led to a full-time theatrical career, making her professional debut in Sardou's Thermidor in 1891, in which she played the role of Fabienne with Forbes-Robertson. In 1894 she joined the Empire Stock Company under Charles Frohman. In 1901 she brought out The Way of the World under her own management at the Victoria Theatre, and later toured the United States in the role. On stage, she was neither a total failure nor a great success; one critic called her "the leading exponent of the peculiar art of wearing good clothes well." She became interested in interior decorating as a result of staging plays, and in 1903 she left the theater to launch a career as a decorator. Undoubtedly one of the first interior designers, Elsie de Wolfe is considered by some to have invented the occupation, although evidence reveals the profession existed before she made her considerable name. Through her efforts, American homes were introduced to a succession of sophisticated yet simple ideas, generally based on her preference for late 18th-century French style. Many elements aided her in becoming such an influential figure in the emerging field — her social connections, her reputation as an actress and her success in decorating the interior of the Washington Irving House, the residence she shared with her close friend, Elisabeth Marbury. Preferring a brighter scheme of decorating than was fashionable in Victorian times, she helped convert interiors featuring dark, heavy draperies and overly ornate furnishings into light, soft, more feminine rooms. 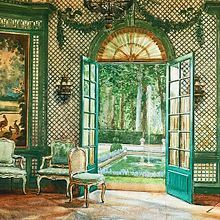 She made a feature of mirrors, which both illuminated and expanded living spaces, brought back into fashion furniture painted in white or pale colors, and indulged her taste for chinoiserie, chintz, green and white stripes, wicker, trompe-l'oeil effects in wallpaper, and trelliswork motifs, suggesting the allure of the garden. As de Wolfe claimed: "I opened the doors and windows of America, and let the air and sunshine in." Her inspiration came from 18th-century French and English art, literature, theater, and fashion. De Wolfe's taste was also practical, eliminating in her schemes the clutter that occupied Victorian homes, enabling people to entertain more guests comfortably. She also popularized the chaises longue, faux-finish treatments, and animal print upholstery. In 1905, Stanford White, the architect for the Colony Club and a longtime friend, helped de Wolfe secure the commission for its interior design. The building, located at 120 Madison Avenue (near 30th Street), would become the premier women's social club on its opening two years later, much of its appeal owing to the interiors de Wolfe arranged. Instead of the heavy, masculine overtones then pervasive in fashionable interiors, de Wolfe used light fabric for window coverings, painted walls pale colors, tiled the floors, and added wicker chairs and settees. The effect centered on the illusion of an outdoor garden pavilion. (The building is now occupied by the American Academy of Dramatic Arts.) The success of the Colony Club proved a turning point in her own life and career, launching her fame as the most sought-after interior decorator of the day. Over the course of the next six years, de Wolfe designed interiors for many prestigious private homes, clubs, and businesses on both the East and West coasts. By 1913, her reputation had grown so that her studio took up an entire floor of offices on 5th Avenue. That year she received her greatest commission — from coal magnate Henry Clay Frick, one of the richest men in America at the time. Elsie de Wolfe in Red Cross volunteer uniform, from a 1919 publication. De Wolfe's 1926 marriage to diplomat Sir Charles Mendl, the British press attache in Paris, was page-one news in the New York Times. The marriage was platonic and one of convenience. The pair appeared to have married primarily for social amenities, entertaining together but keeping separate residences. In 1935, when de Wolfe published her autobiography, she didn't mention her husband in it. Although his career had been of no great distinction, Mendl's knighthood was allegedly bestowed due to his retrieval of letters from a gigolo who had been blackmailing Prince George, Duke of Kent. The Times reported "the intended marriage comes as a great surprise to her friends," a veiled reference to the fact that since 1892 de Wolfe had been living openly in what many observers accepted as a lesbian relationship. As the paper put it: "When in New York she makes her home with Miss Elizabeth Marbury at 13 Sutton Place." The daughter of a prosperous New York lawyer, Elisabeth (Bessy) Marbury, like de Wolfe, was also a pioneer career woman. She was one of the first female theater agents and one of the first woman Broadway producers. Her clients included Oscar Wilde and George Bernard Shaw. During their nearly 40 years together, Marbury was initially the main support of the couple. Dave Von Drehle speaks of "the willowy De Wolfe and the masculine Marbury ... cutting a wide path through Manhattan society. Gossips called them "the Bachelors." Expecting nothing to change in their relationship due to her marriage to Mendl, de Wolfe remained Marbury's lover until the latter's death in 1933. In 1926, The New York Times described de Wolfe as "one of the most widely known women in New York social life," and in 1935 as "prominent in Paris society." In 1935, Paris experts named her the best-dressed woman in the world, noting that she wore what suited her best, regardless of fashion. De Wolfe had embroidered taffeta pillows bearing the motto "Never complain, never explain." On first seeing the Parthenon, De Wolfe exclaimed "It's beige—my color!" At her house in France, the Villa Trianon, she had a dog cemetery in which each tombstone read, "The one I loved the best." In Irving Berlin's Harlem On My Mind the singer professes to prefer the "low-down" Harlem ambience to her "high-falutin' flat that Lady Mendl designed." One of the color schemes she popularized was the inspiration for the Cole Porter song "That Black and White Baby of Mine" (whose lyrics include the lines "All she thinks black and white/She even drinks Black & White"). In Cole Porter's lyric about modern scandals, "Anything Goes," he observes, "When you hear that Lady Mendl, standing up/Now turns a handspring landing up-/On her toes/Anything goes!" Cole Porter also refers to her in the song Farming from the musical Let's Face It! . The lyric describes the celebrities who have gone back to nature: Kit Cornell is shelling peas, Lady Mendl's climbing trees, Farming is so charming they all say!" Elsie de Wolfe is referred to AS "Maid Mendl" in Osbert Sitwell's satirical and poem, Rat Week. "That gay, courageous pirate crew, With sweet Maid Mendl at the Prow, Who upon royal wings oft flew, To paint the Palace white -- (and how!). The House in Good Taste. New York: The Century Company. 1913. Elsie de Wolfe's Recipes for Successful Dining. New York: D. Appleton-Century Company. 1934. After All. New York: Harper and Brothers. 1935. Charlie Scheips (2014). Elsie de Wolfe's Paris: Frivolity Before the Storm. New York: Harry N Abrams. ISBN 978-1419713897. ^ "Lady Mendl" was frequently used by the press during her married life. "Elsie de Wolfe" is the name that appears as author of her published books; modern biographers usually use this form of the name. "Lady Elsie de Wolfe Mendl" is mentioned by The Encyclopedia of World Biography Supplement, volume 20, Gale Group, 2000. "Ella Anderson de Wolfe" is given by the Encyclopædia Britannica as her name "in full," adding "married name 'Lady Mendl'"
^ a b c d Flanner, Janet (1938) "Handsprings Across the Sea," The New Yorker, 1938-01-15, as posted online : "Twenty years after  she had made a million and an international name by inventing the new fashionable profession of interior decorating. ^ Ghostwritten by Ruby Ross Wood: Abercrombie, Stanley (1999), "100 Years That Changed Our World," Interior Design 12/1/1999, as presented online [permanent dead link] In 1913... Elsie de Wolfe publishes her book The House in Good Taste, based on previously published articles ghost written for her by Ruby Ross Wood. In 1914, Ruby Ross Wood and Rayne Adams write The Honest House. ^ Goodyear, Dana (September 14, 2009). "Lady of the House". The New Yorker: 60–65. ^ Candee, Helen Churchill, How Women May Earn a Living, New York: Macmillan & Co, 1900, pp. 103-105. ^ Wilson, Scott. Resting Places: The Burial Sites of More Than 14,000 Famous Persons, 3d ed. : 2 (Kindle Location 12109). McFarland & Company, Inc., Publishers. Kindle Edition. ^ Sparke, Penny; Mitchell Owens; Elsie De Wolfe (2005). Elsie De Wolfe: The Birth of Modern Interior Decoration. Acanthus Press. ISBN 0-926494-27-9. : "Considered the mother of interior decoration" is from a synopsis of this book, attributed to "Book News, Inc., Portland, OR," at bookseller's website . ^ Franklin, Ruth (2004) "A Life in Good Taste: The fashions and follies of Elsie de Wolfe," The New Yorker, Sept. 27, 2004. ^ a b "Elsie de Wolfe to Wed Sir Charles Mendl; Their Wedding Set for Tomorrow in Paris," The New York Times, March 9, 1926, p. 1: early career as actress, "most widely known women in New York social life." ^ Munhall, Edward. "Elsie de Wolf: The American pioneer who vanquished Victorian gloom". Architectural Digest. Archived from the original on 10 December 2011. Retrieved 27 October 2011. ^ Franklin, Ruth (September 27, 2004), "A Life in Good Taste: The Fashions and Follies of Elsie de Wolfe." The New Yorker . ("according to Hilda West, de Wolfe’s longtime secretary, de Wolfe had simply decided she wanted a title). ^ De Wolfe, Elsie, After All (1935), p. 256. ^ Malcolm Lazin (August 20, 2015). "Op-ed: Here Are the 31 Icons of 2015's Gay History Month". Advocate.com. Retrieved 2015-08-21. Wikimedia Commons has media related to Elsie de Wolfe.